﻿ Hotel Picasso Rome. JIMAT di Agoda.com! Hotel Picasso, terletak di Monti, Rome, merupakan satu pilihan popular bagi para pelawat. Hotel ini terletak 0 km dari pusat bandar dan menyediakan akses kepada kemudahan bandar yang penting. Syurga untuk berehat dan bersantai, hotel ini akan menawarkan pembaharuan penuh hanya beberapa langkah dari pelbagai daya tarikan bandar seperti Via Nazionale, Gereja San Paolo entro le Mura, Teatro dell'Opera. Kemudahan dan perkhidmatan yang disediakan oleh Hotel Picasso memastikan penginapan yang menyenangkan bagi para tetamu. Kemudahan utama hotel termasuklah Wi-Fi di tempat awam, pemindahan dari/ke lapangan terbang, lawatan, lif. Suasana Hotel Picasso terpancar di dalam setiap bilik tetamu. pendingin hawa, pemanas, meja, bar mini, telefon hanyalah sebahagian daripada kemudahan yang boleh didapati di hotel tersebut. Di samping itu, pihak hotel menawarkan aktiviti rekreasi untuk memastikan anda mempunyai perkara untuk dilakukan sepanjang penginapan anda. Hotel Picasso adalah destinasi sehenti anda bagi penginapan hotel berkualiti di Rome. Tetamu yang berumur 6 tahun dan ke atas dianggap sebagai orang dewasa. As of January 1st 2011, the Municipal Council of Rome has introduced a room occupancy tax in the amount of maximum EUR 3.00 per person per night – applicable for maximum 10 days. Starting from September 1st, 2014 the amount has been increased up to EUR 7.00 per person per night (depending on the accommodation type and star rating). Children under the age of 10 years are exempt from payment. The fee will be asked of anyone staying in overnight accommodation inside Rome’s boundaries at the end of each stay. The fee is not included in Agoda's price and must be paid at the Hotel. Sila ambil perhatian, daftar masuk dilakukan di Via Palermo 75, berhampiran hotel. 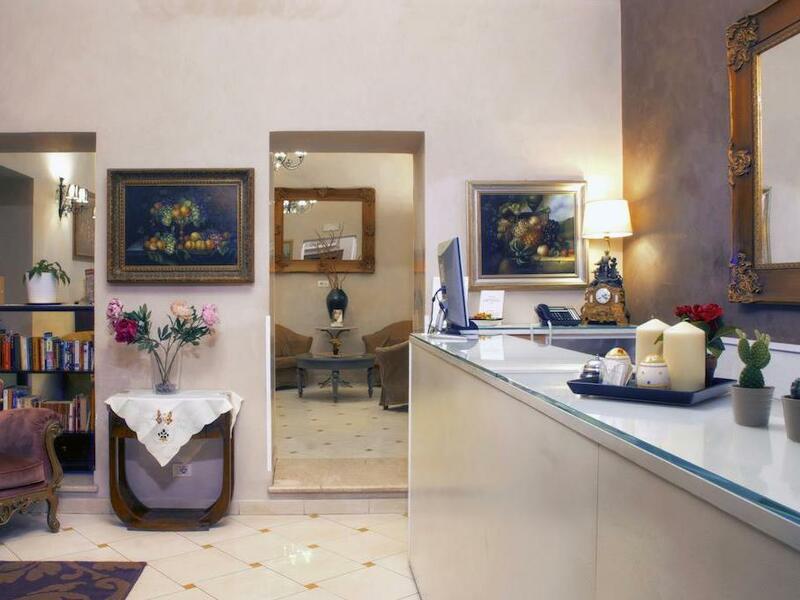 staff is helpful, rooms are small but nice, location is great for discovering the city. clean room, good security and centrally located. verdict : average. u get what u paid for. The rooms here are extremely small but they are clean and sufficient enough for a solo traveler. The location is excellent. I walked all around Rome: Collisseum, Trevi Fountain, Spanish Steps all within walking distance. The staff was very friendly and helped me plan my walking tours. just a fore-warning. the room is small. but good enough for two big luggage and two chairs. no pun intended. the staff is friendly. our aircon broke down during midday. he apologized and brought us a fan in the meantime while he tried to fix the problem. the thing is, we will expect him to give up after half hr of trying, but he called the technicians and even 'rebooted' the entire hotel circuitry just to try to get us the aircon in the sweltering weather. not too bad a place. only issue is the small room. but still, a value for money hotel. it was quite more than value for money. hotel locates in a very nice place and easy to go to any place. Jeg ved ikke hvorfor vi fik et bedre hotel end det vi havde bestilt. Vi er bare tilfredse. Todo bien pero destacar que el desayuno era muy pobre y no había presión de agua caliente. Para conexión a internet teníamos que ir al hotel Caravaggio que estaba en frente y es de la misma compañía y unicamente había conexión en la Recepción. El personal correcto, zonas limpias y por decir algo más a su favor destacar que de 18,00 a 20,00h cada día en el Hall de la Recepción se da un pequeño refrigerío gratis con alguna bebida y chips. No está mal si es para una escapada de un par de días. hotel en muy buena zona,cerca de monumentos a pie,a 150 metros de estacion de republica y a 300 de termini,la habitacion comoda y el desayuno es completo. Η ντουζιέρα ήταν τελειώς κλειστή και δε γέμιζε νερά το μπάνιο, το πρωινό α΄πλό, αλλά νόστιμο, εύκολη και καλή τοποθεσία. Όλα ήταν μια χαρά!Εύκολη και κεντρική τοποθεσία, πρωινό βασικό, αλλά καλό, δωμάτιο καθαρό, η ντουζίερα ήταν κλειστή και δε γέμιζε το υπόλοιπο μπάνιο νερά. Το μόνο αρνητικό ήταν ότι είχα επιλέξει διπλό κρεβάτι, αλλα τελικά ήταν δύο μονά.